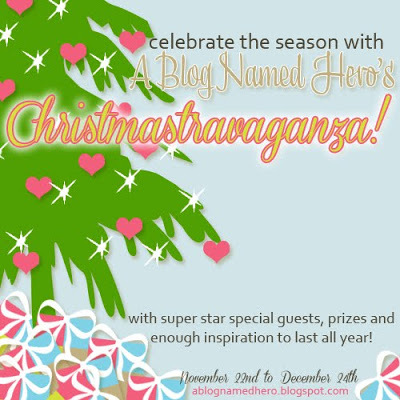 It’s Amy T here…thrilled to be part of the Christmastravaganza!!!!!! I have a small but happy stash of Hero Arts goodness. So, when I thought about what kind of project I wanted to share, I knew that I wanted to create a holiday banner. I’ve been smitten by dictionary pages lately…I think they make a great base for any paper crafting project. The glittery K&Co alphas have been in my stash f-o-r-e-v-e-r! The best part of this project…. I don’t tend to make anything for me to keep, kwim? Would love to see your holiday banners….link up! Follow the Rafflecopter directions (below) to enter the giveaway. Such a fun and beautiful banner! Wonderful banner, love the glittery letters!!! Amy, the banners are lovely and festive! I rarely keep anything I make as well, my best work is at my Mum's and my sister's homes! I get to see them when I visit! Love your pairing with the text, stamps and glitter!! Festive and gorgeous banners! Love it, Amy! Amy this is such a fabulous banner. Fabulous banner–love the glitter and the dictionary pages. This is fantastic and so simple. Lovely. Especially with the tags and book pages…So Fun! Dictionary pages – EXCELLENT idea – and you could even choose the 'page,' highlighting specific words. Cool! Your banner is gorgeous and certainly inspiring. Thank you for sharing – and yes, be sure to keep it! I really love your banner. You've inspired me to try making one of my own–especially since I, too, have some glittery letters in my stash. And they're red! Just right for Christmas. Wow love the dictionary print and the oh so cute banner!! Wow girlfriend, love, love , love it!!! I love the background of the dictionary paper–it sets the tone for the project. Beautiful, vintage, loveliness! This is beautiful! LOVE the sparkle!!! Cute banner. Great idea for any occasion. glitter and doily…oh! my…what a beautiful banner! What a sweet little banner! TFS! Fabulous banner! Love everything about it and I would keep it too! What a wonderful banner! I love it and always love Amy's work! What a lovely banner. I have some of those stamps so I could do this! I like your use of the aged dictionary papers with the glittery letters, very festive. Great banner! I love the sparkly letters and the book pages! Such a beautiful and fun banner..TFS !!! Amy, this is such a beautiful and creative banner! Just love it! Sorry that I don't have a banner to link up, but I do really like yours! Beautiful banner! Great way to decorate! what a fab banner! and great use of tags 🙂 love your work amy! I love that banner…especially the inclusion of the tags! So fun! Very cute, you did well with your limited supplies. I have never made a banner but I really like your, very festive! Super fabulous!!! Love how you have used the dictionary pages, they add such a great detail! Such a great way to use the pages from old books! TFS! My favorite word (JOY) in a beautiful way! Great idea – love the dictionary paper behind. Lovely little Project with Big inmpact! Oh cool banner! Banners would also make great package decorations particularly on larger gifts! This is just awesome! I so love it! This is amazing. Lobe the glitter and partial embossing. Fabulous vintage looking banner, love your style Amy. That is an adorable banner! I think I'm going to make the parts put and have my granddaughter make one. She loves to 'help' with projects. love the dictionary pages and the banners. Gorgeous banner, Amy! Love the dictionary paper. I'm glad you finally found a use for the letters! It's always a good thing tio use stuff from your stash! This is so simple and beautiful! I LOVE it! Thanks! How awesome is this! Thank you for such an update on your blog, it is really appreciated. And when it comes to banners, nothing in this day and age can match the productivity and efficiency of these fabric banners they are the best thing to have happened in business. Cute banner–it's one project I still haven't tried! I love the look of book pages! Wonderful banner. Banners are popular. I like using dictionary pages also. Had gone to a Half Price Book store to find a dictionary to buy but they were all too expensive even at half price so I took one of my older dictionaries, tore out a couple pages & scanned them. Awesome banner, Amy! That happens to be our daughter's name so that would be a great gift, too! Terrific banner! I've never made one, but this one surely tempts me! This project makes me wish I had a fireplace mantle in my home. Love the vintage feel. I have some silver Thickers that have been in a drawer for years – thanks for the great idea to use them. Wow wow wow!! This is GORGEOUS Amy!! I love love love love the glittered letters, the tags and loveeeeeeeeeeee the book pages! FABULOUS!!! Fabulous banner, Amy, love those book pages! Such a fun thing to use for your decoration! Have fun with your decorating! Amy's banner is awesome..love the fun glitter and just such a great idea…thanks for sharing. Amy is right on with this stunning banner. LOVE it! Wow! What a banner! You are a crafty godess! I love the vintage look of this banner. This is beautiful, Amy! Love those glittery letters!